Fisher Paints offers sales and rentals of paint sprayers. 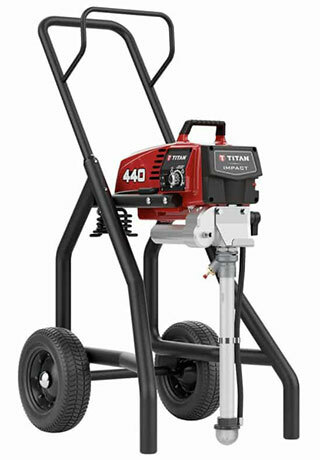 We carry quality equipment from the top manufacturers, and we now offer a Lowest Price Guarantee on Graco and Titan sprayers! Whether you’re about to paint your interior or exterior, consult with one of our experienced technicians to help you complete your painting project with professional results. As the leader in airless spray technology, Titan offers world-class, end-to-end solutions for the industry. Their focus on innovation goes beyond pioneering new technologies, products and services. It’s about developing the tools and equipment painters need to do their jobs better, and for you to improve your bottom line. Since 1926, Graco Inc. has been a leading provider of premium pumps and spray equipment for fluid handling in the construction, manufacturing, processing and maintenance industries. Graco offers innovative products that set the quality standard for spray finishing, paint circulation, lubrication, sealant and adhesives dispensing, and contractor power equipment. 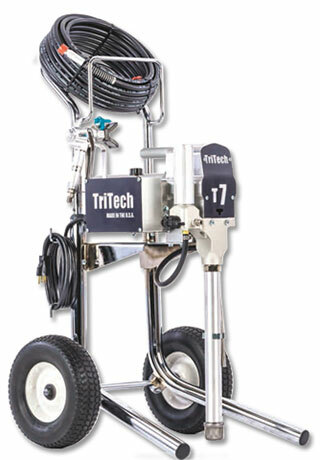 TriTech Industries Inc. manufactures precision, high quality, airless paint Spraying equipment, airless guns, tips and accessories for professional painters. 100% made in the USA. Their goal is to produce the highest quality airless equipment on the market today. WIWA, founded in 1950, is one of the world’s leading developers and manufacturers in the areas of 1K and 2K airless spray-painting units, fluid handling, material extrusion and injection systems. Its technology boasts a proven track record in the fields of decorative and protective surface coating. Ideal for residential, property maintenance, and small commercial applications, this high-performance electric airless sprayer will apply all standard architectural primer, paints & coatings efficiently. 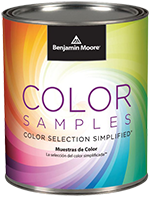 Sprays stains, lacquers, enamels, latex, & other low &medium viscosity coatings. 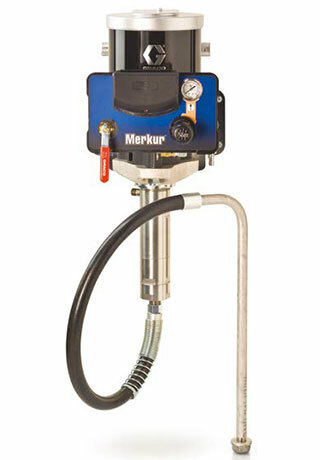 The new and improved Merkur packages are designed to outperform and outlast other pumps in their class. With many variations of this model to choose from, you get the exact pressure and output you need for all of your paint jobs and projects! An extremely powerful, electric airless spray pump suitable for both commercial and fine finish applications.